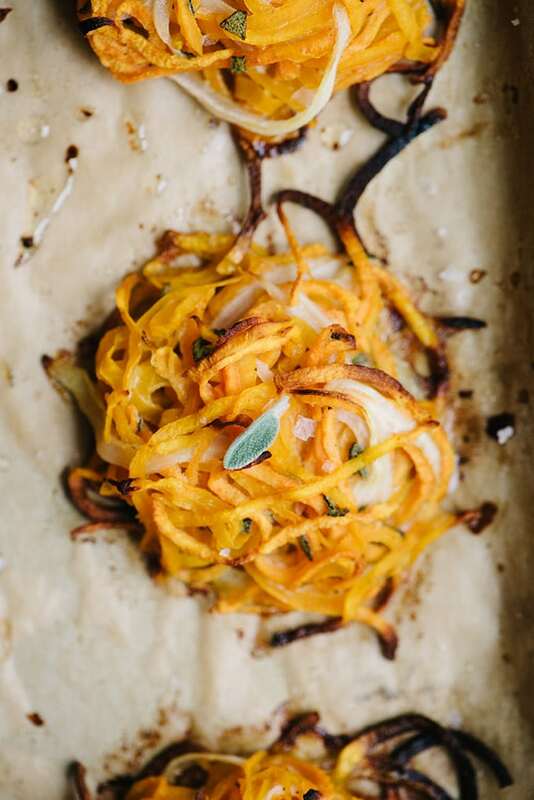 Butternut squash and sweet potato are fall flavor BFF’s. When you’re craving this seasonal combo but tired of soups and casseroles, reach for these baked fall fritters. They’re airy and crispy, with an herby bite. And since they’re baked not fried, you won’t be slaving over the stove to crank them out. 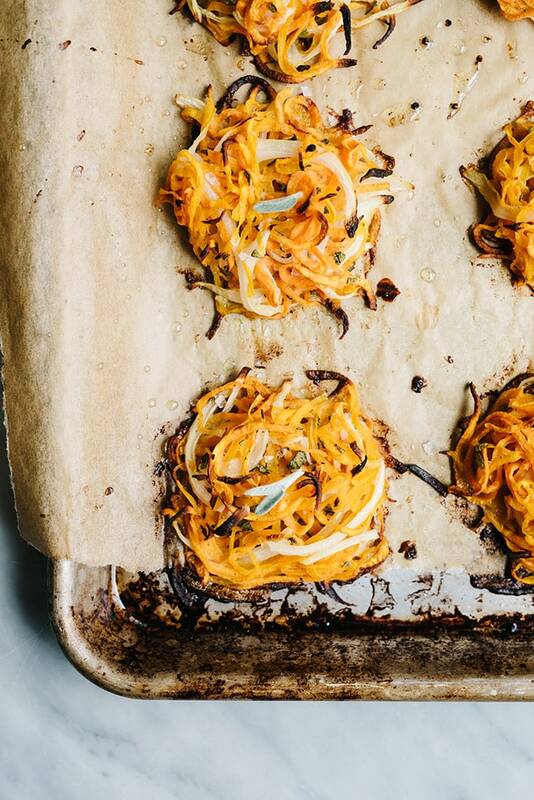 I have a “thing” for veggie fritters (or latkes, or pancakes). Fritters sounds so fancy to me, so I’m sticking with it. Whether they’re crispy potato latkes topped with sour cream and chives, or airy zucchini fritters with a dollop of greek yogurt matters little, so long as I get to consume them in one way or another on the regular. They’re easy to make, easy to eat, and even my kids will take a nibble from time-to-time. Sold. 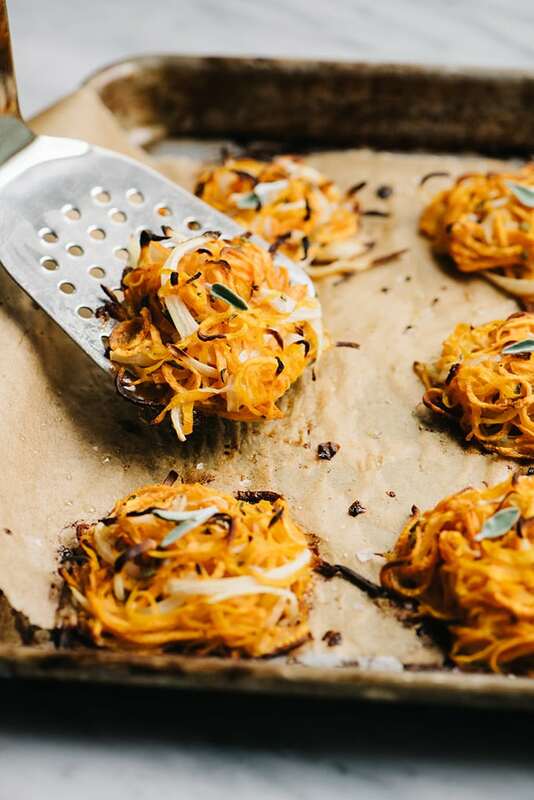 I’ve been fiddling with this recipe for butternut squash and sweet potato fritters for awhile now. They had me stumped for a time. My go-to methodology of “toss all the ingredients together then fry until crispy” kept failing me, probably because I adamantly refused to add a gluten binder to the batter. I know, I know – I’m difficult. And then last week I baked them instead of pan-frying, and just like that, they came out perfect. >>> Pin it now! 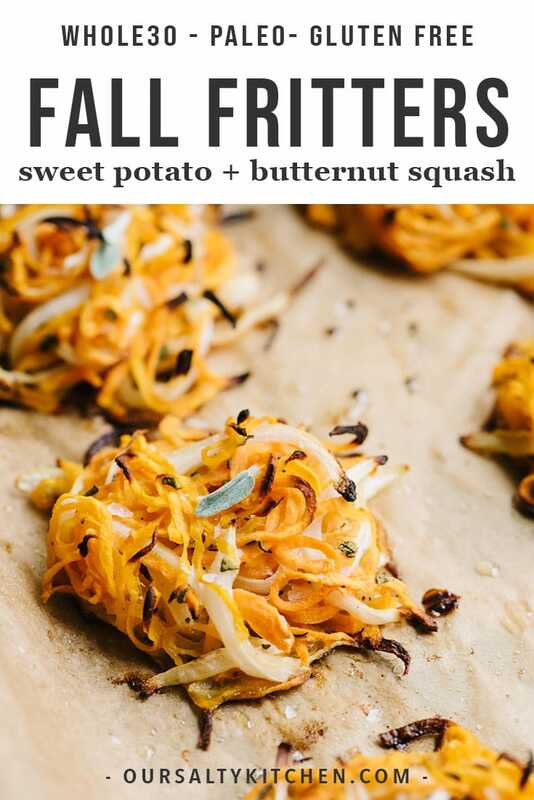 Click here to save these fritters to your Fall Recipes board on Pinterest. Sweet potato and butternut squash go together like peas and carrots, or Saturdays and pajamas, or brothers and sisters (minus all the early childhood squabbling). When you crave this combo but can’t stand another soup or casserole, reach for these sweet potato and butternut squash pancakes. They’re airy and crispy, with the perfect al dente bite and herby edge. 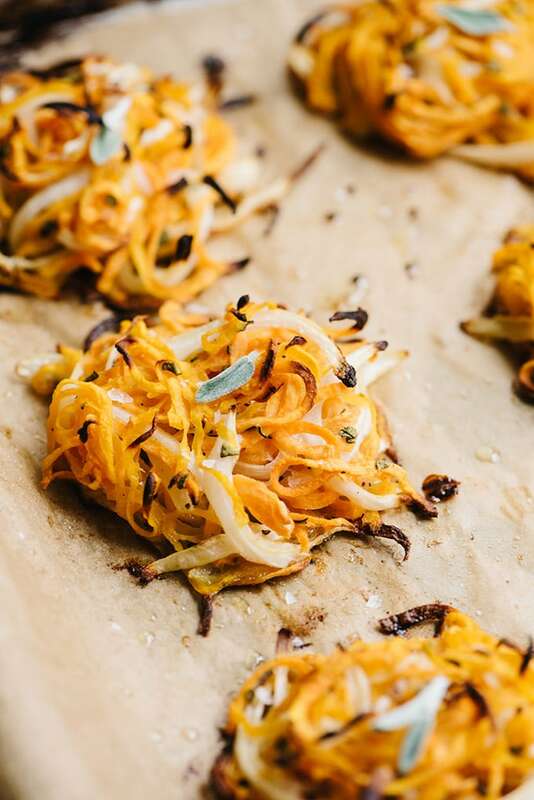 Thinly slice a sweet onion, then shred two sweet potatoes and a small butternut squash. 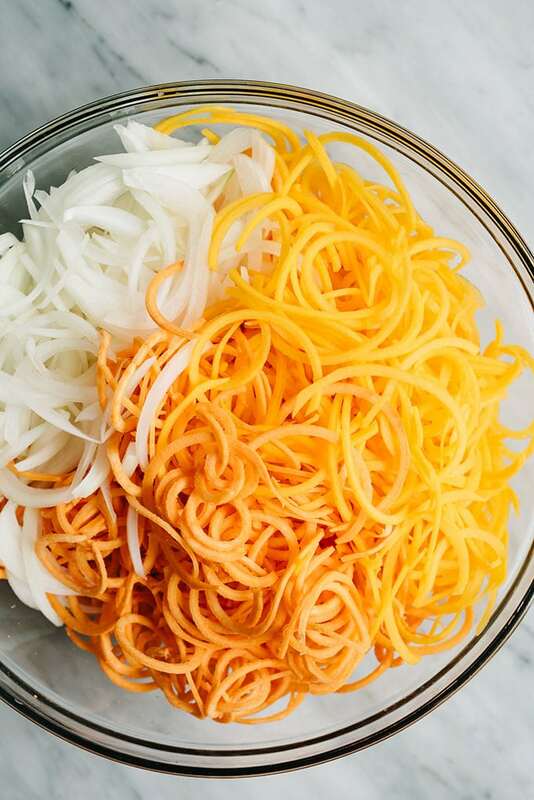 Bust out your spiralizer or food processor for this job. You’ll thank me later. Toss the shredded vegetables together with three eggs, fresh sage, salt and pepper, and then toss again with arrowroot powder. Make sure you toss until all of the noodles are uniformly coated. Your (clean) hands are the perfect tool for the job. Scoop third-cup mounds of the veggies onto a parchment lined baking sheet. I can fit 6 on a quarter sheet, or 12 on a half sheet. Bake until the vegetables are soft and the edges are crispy. Top with a little more fresh sage and a sprinkle of flaky salt. Serve them hot. 1 serving (about 2 pancakes) provides a whopping 300% of your daily Vitamin A, and about 40% of your daily Vitamin C. Hello yummy nutrients. 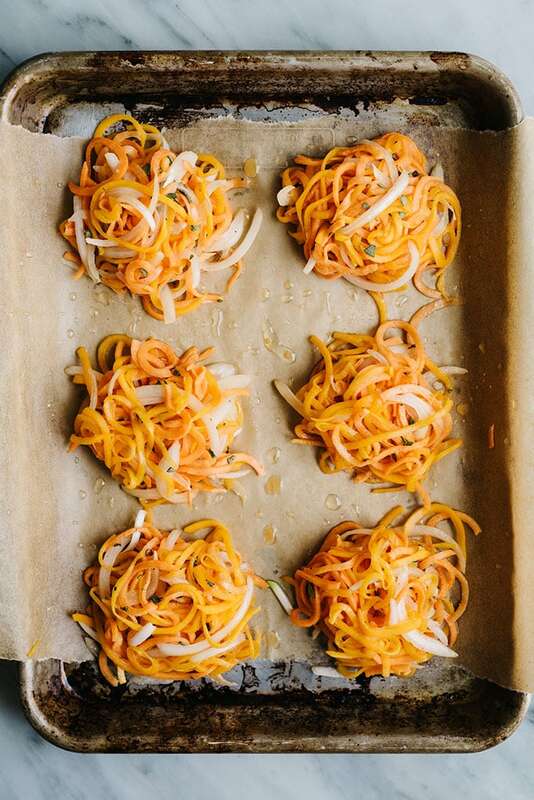 DID YOU MAKE THIS RECIPE FOR BUTTERNUT SQUASH AND SWEET POTATO FRITTERS? I WANT TO SEE YOUR CREATIONS! SNAP A PICTURE AND SHARE IT HERE ON PINTEREST. Sweet potato and butternut squash go together like peas and carrots, or Saturdays and pajamas, or brothers and sisters (minus all the early childhood squabbling). 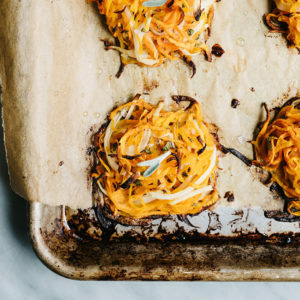 When you crave this combo but can't stand another soup or casserole, reach for these sweet potato and butternut squash pancakes. They're airy and crispy, with the perfect al dente bite and herby edge. Position a rack in the center of the oven, then heat the oven to 450°F. Line a baking sheet with parchment paper. 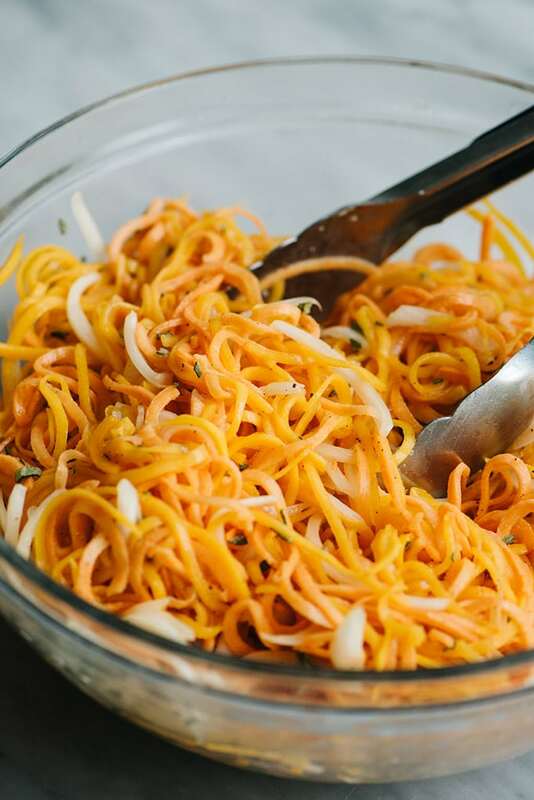 Peel, seed, and shred the butternut squash using a spiralizer, vegetable mandoline, or food processor (using the shredding disc). Peel and shred the sweet potatoes using the same. Toss the shredded butternut squash and sweet potato with the onions in a large bowl. Add the beaten eggs, sage, pepper, and salt and toss until each strand is coated. Add the arrowroot powder and thoroughly toss to coat once more. Grease the parchment paper with the olive oil. Scoop third-cup mounds of the fritter vegetables onto the greased parchment paper, leaving an inch of space between each. You should be able to make 12 fritters total, and they should fit onto one large half sheet or two smaller quarter sheets. Bake at 450°F for 20 minutes until the edges are crispy and the vegetables are soft. 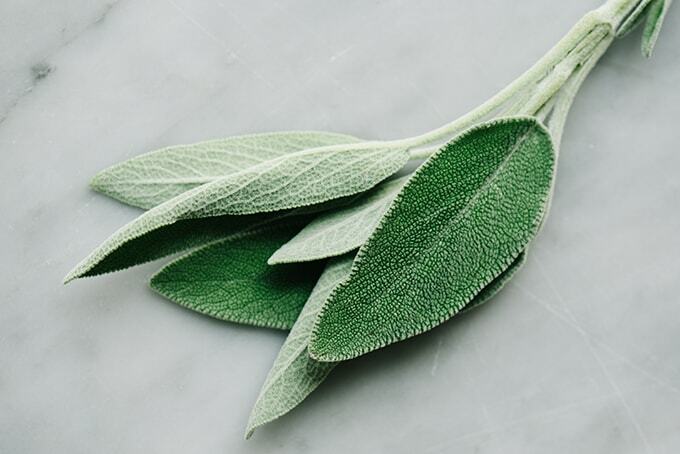 Remove from the oven, dust with more fresh sage and maldon sea salt, and allow to rest an additional five minutes. Serve warm. These keep in the fridge for up to 5 days. Reheat in a 325°F oven for 10 minutes until warmed through. Disclaimer: This post contains affiliate links, which means we receive a small commission (at no cost to you!) 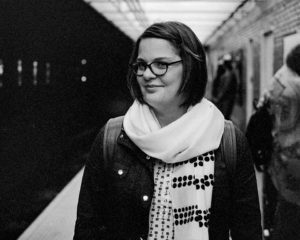 if you make a purchase using these links. Rest assured, we only endorse products we own and truly love!